Welcome to my photography web site. You will note immediately that I shoot mainly nature and wildlife photos, and not a lot else. Anyone who knows me will not be surprised at my preference to shoot outdoors, any time..any place! My photography is an extension of my fixation with the natural world. I started out like most kids raised in the country; from an extremely early age I "collected" everything! Pit vipers, Carolina Anoles, arrowheads, terrapins, Raccoons, Foxes...everything. Some, like the Raccoons and the Red Fox, had the run of the house. I don't know if my parents were encouraging my "scientific studies", or simply overwhelmed with by my boundless energy! From there it was on to a Bachelor of Science Degree in Wildlife Conservation, with a minor in Botany at Southeastern Oklahoma State University, where I got into photography. And it was shortly after I graduated college, and moved to Moscow Idaho, that I got out of photography. A house fire took everything; cameras, photos, darkroom...and strangely, my desire to photograph. Twenty years later I picked up a digital camera while in New Zealand, and ... here I am, again. Since I like to keep it natural, none of my wildlife photos include animals which could not leave for other parts. Each and every photo is of a free roaming critter, which is the way it should be. If I do post a photo of a penned animal I will tell you, and why. You will also note that many of my photos show the habitat of the animal or bird, rather than just the "target" with a clean background. Though I will post photos which show nothing but the animal or bird, I know that without habitat you have nothing. In keeping with that reality I will always try to tell you where I took the photo, show you a bit of the surroundings, and tell you what the animal was doing at the time of capture. Anyway, here you will find some of my best work, and my worst (I'll let you decide which is which!). Most of these photos have been collected since early 2009, along with many many thousands more. The rest of my photo collection may contain something you want, or need, but do not see here. In short, if you need a photo of a Wilson's Snipe on it's nest let me know. I have photos of nests in last year's grass, in this years' green grass, in leaves on top of mud...you get the "picture". Talk to me, I may have the stock photo you need for that project you are working on, or that perfect greeting card that says "you". The fastest way to find a photo I may have is to go to the "Search" page, then type in your key word (Barren Ground Grizzly, Hog-nosed Snake, Snow, etc) to locate the photos of the subject you are looking for. Many of the birds are also identified by their French and Spanish names. Bay Photo, one of the best photo printers in North America, prints your orders on the medium of your choice (traditional papers, aluminum sheet, canvas, etc) then ships your order directly to you (without the very ugly watermark I am forced to put on the face of my photos on this site). If you prefer a framed print over a simple print e-mail me your needs' at tdaleharmon@gmail.com. I will be happy to personalize your project and ship your order from Alpine, California. Please check back on my site regularly as I add photos nightly! You can also keep up with me on my Facebook page which you will find at https://www.facebook.com/traceyharmonphotography or at my National Geographic page which you will find at http://yourshot.nationalgeographic.com/profile/1628600. Now, go inside the galleries and see what's in here! From there I hope I inspire some of you to go outside and take a walk, with a camera at your side! 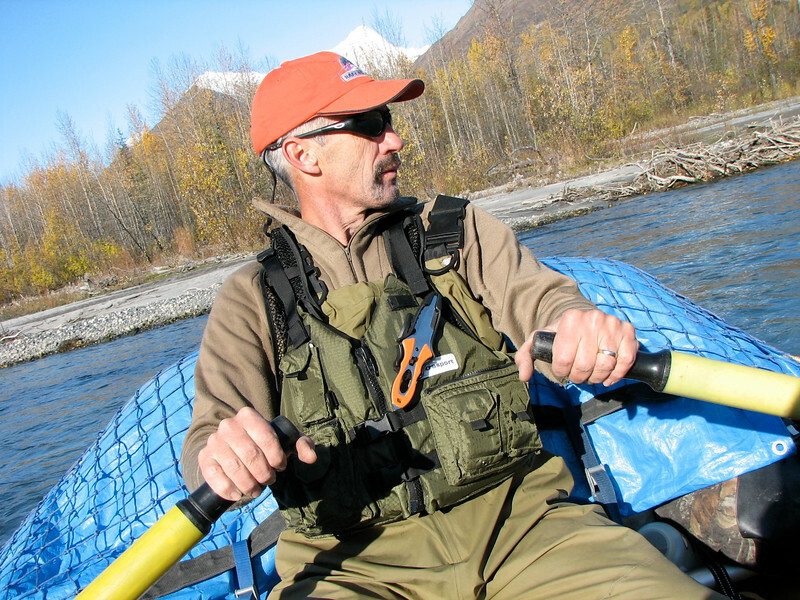 That's me, on the sticks while floating Alaska's Kahiltna River!